We have extended our Fundraiser Cards expiration date to December 31st 2016! 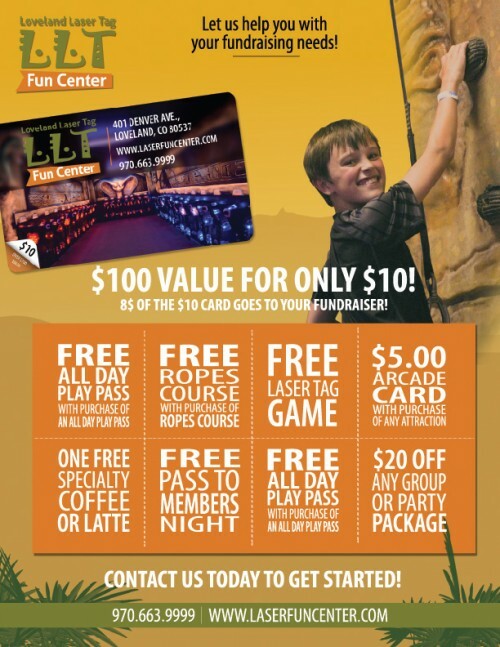 Let LLT Fun Center help with all of your fundraising needs! We work with schools, sports organizations, church groups, and non-profit groups. No matter how big or small the need, we can help. The most profitable way to meet your goals. We provide you with coupon cards that include free games valued at over $100. There is no cost to you, sell them for $10 and keep $8. Perfect for those who want to have fun while still raising the funds you need. Book an event with us and we will donate a portion of the sales back to your group. We even help you design your invitations!! Reserve our facility at an affordable rate and get donations from your guests for them to enjoy unlimited laser tag, laser maze, climbing wall, and our 2-story ropes course. Please contact us to let us help you organize your fundraising event! !